Originally published as Occasional Paper Number 2/1995, Programme for Strategic and International Security Studies (PSIS), Graduate Institute of International Studies, Geneva, 1995. The Chemical Weapons Convention breaks new ground not only in arms control and disarmament but in international law in general. The treaty, which was opened for signature in 1993 and is expected to enter into force in 1996, provides for the most comprehensive verification and compliance system of any global treaty. This paper identifies thirteen provisions in the treaty designed to promote compliance and to help prevent non-compliance. Highly intrusive inspections, including challenge inspections which may occur at any site in any State Party, will be the backbone of the verification process (described in Part III.A). These inspections are to be carried out by a new international agency, the Organization for the Prohibition of Chemical Weapons (OPCW), whose structure and functions are reviewed. The reports from the inspectors are sometimes kept confidential and sometimes circulated to all States Parties-depending on the content of the reports (Part III.B). If the inspection system uncovers uncertainties about compliance on the part of a particular State Party, the next stage of the compliance system is activated, beginning with steps by the Director-General to obtain clarification of dubious information, and in the case of problems, the Director-General attempts to persuade the State party involved to rectify the situation (Part III.C). The Convention does not directly state who determines whether non-compliance has occurred but it gives the organs of the OPCW sufficient latitude to make decisions on the point (Part III.D). If a finding of non-compliance is made, the OPCW may request the State party to rectify its behaviour, and may take various measures to persuade and pressure it to do so and, finally, in extreme cases, it may refer the matter to the UN Security Council for stronger action (Part III.E, Part III.F and Part III.G). The treaty also offers incentives for States Parties to comply. If a State Party is attacked with chemical weapons, the OPCW will provide assistance and protection (Part III.H). Also, the treaty offers a degree of free trade in chemicals (Part III.I). It suggests mechanisms for the peaceful resolution of disputes (Part III.K). Possibly the most important innovation in the Convention's compliance system is its requirement that States Parties enact legislation to make the Convention binding on its citizens and thus to criminalize any behaviour that is prohibited to States Parties (Part III.L). The Convention also mandates the creation or designation of a National Authority in each State Party to communicate with and assist the OPCW (Part III.M). Section IV begins with an assessment of some of the strengths and weaknesses of the Convention. This is followed by an outline of several proposals for improving the compliance system through non-violent measures involving pressure and coercion. Among other things, it is proposed that the Conference of the States Parties publish an official list of consequences that might be expected to befall a country that refused to rectify its non-compliance. Ten items are suggested for inclusion on this list. Finally, there are some reflections on the criteria for assessing the efficacy of a compliance system under a multilateral treaty. The paper concludes with a plea for greater attention from the academic community to the emerging topic of treaty compliance methodology. The point is made that the CWC will likely be a model, a conceptual starting point, for compliance regimes under many future treaties. A full understanding of the CWC compliance regime is therefore important. "I was at Ypres when the chlorine cloud was first released—a gas wall, a hundred feet high and two miles long; I saw the French Colonial Troops flying [sic] in terror, and throwing away their weapons as they ran; I saw the Canadian soldiers choking to death, with an evil yellow froth oozing from their mouths." As a result of widespread outrage against the dreadful toll of chemical weapons in World War I (about 100,000 fatalities and 1.3 million casualties), nations which had gathered in Geneva in 1925 signed a "Protocol for the Prohibition of the Use in War of Asphyxiating, Poisonous or other Gases, and of Bacteriological Methods of Warfare." The 1925 Geneva Protocol, citing chemical weapons use in war "as condemned by the general opinion of the civilized world", has as its goal making the prohibition "universally accepted as a part of International Law, binding alike the conscience and the practice of nations." While the Protocol remains one of the pillars of arms control, it contains two major shortcomings: the prohibition on use leaves nations free to develop and stockpile chemical weapons (and thereby threaten their use) and, secondly, it provides no means of verifying or upholding compliance. Prior to the World War II, German scientists discovered a new class of chemical weapons, the nerve gases, which were then stockpiled in abundance. At the same time, Japan, which had signed the Protocol in 1925 (but did not ratify it until 1970), used chemical weapons in its quest to gain Chinese territory. After World War II, discussions began in the United Nations on a comprehensive prohibition of chemical weapons. These finally reached fruition in 1993, with the opening for signature of the Convention on the Prohibition of the Development, Production, Stockpiling and Use of Chemical Weapons and on their Destruction (or the Chemical Weapons Convention for short). imposes restraints on the production and transfer of certain industrial chemicals capable of dual-use, i.e., chemicals which can be used for peaceful purposes and for producing chemical weapons. Secondly, the treaty provides for the most comprehensive and intrusive system of verification to date of any disarmament treaty applied on a global scale (or in any area of international law for that matter). The verification provisions of the treaty, dealing with on-site inspections, have been examined in hundreds of studies by academics and government officials, but important issues going beyond the technical methods of on-site inspection have been much less studied. In fact, one very important issue, rarely discussed, concerns the final act of the verification process: the decision as to whether a violation has occurred. Fundamental questions to be asked are: by whom and how are determinations of non-compliance to be made? A third area in which the treaty is path-breaking is in its other compliance provisions, i.e., the measures (in addition to verification) designed to promote compliance and to deal with non-compliance. It is this area which forms the bulk of this study. In particular, there are two questions to be answered: what are the possible responses by the administering agency to non-compliance? What other mechanisms and structures can be included in the treaty to promote compliance and avoid non-compliance? To some extent, the lack of previous studies on these subjects (not only for this treaty but for the disarmament field in general) is understandable, because these subjects are possibly the most difficult aspects of the disarmament process. Simply put, can compliance be ensured? What can be done when a state does not comply with provisions of a treaty it has signed? Only rather late in the CWC negotiations did governments turn their attention to the question of how to devise clauses for dealing with possible violations. In January 1991, the negotiating states in the Conference on Disarmament released a report (CD/961) containing a draft treaty with substantial compliance provisions. Although the provisions finally included in the Convention are far from ideal, they are nevertheless a vast improvement over any previous disarmament treaty and worthy of detailed study. The importance of compliance provisions can scarcely be over-estimated. The provisions adopted for the Chemical Weapons Convention are likely to set the pattern for future disarmament treaties. There are ways, however, in which the compliance provisions could be strengthened and it is hoped that this study will shed light on the topic to be useful for the development of provisions in future treaties, as well as the further development of the CWC regime. Strong compliance provisions will help make treaties more robust so that the world can move towards an international system based on law and order, a world in which chemical warfare and indeed all warfare waged with weapons of mass destruction becomes increasingly improbable and eventually unthinkable. The treaty, which has been signed by over 160 states since being opened for signature on January 13, 1993, will enter into force a half year after it has been ratified by 65 nations.2, 3 With less than half that number having ratified thus far, entry into force can be anticipated in early 1996 at best. In the interim, governments are meeting in The Hague to prepare for the implementation of this complex treaty. Preparatory Commission meetings are taking place to develop detailed plans for the operation of the future administrative agency for the Convention: the Organization for the Prohibition of Chemical Weapons (OPCW). A Provisional Technical Secretariat has been established to form the nucleus and basis of the future international inspectorate of the OPCW. When the OPCW comes into existence upon entry into force of the Convention, it will consist of three organs: 4 the Conference of the States Parties; the Executive Council; and the Technical Secretariat (to include an Inspectorate). An organizational flow chart of the OPCW is provided in Figure 1. Figure 1 taken with permission from: D. Scott, G. Alexandrowicz, A. W. Dorn, M. Greenspoon, G. Morris, J. Hatfield-Lyon (Markland Policy Group), "Disarmament's Missing Dimension: A UN Agency to Administer Multilateral Treaties", Science for Peace/Samuel Stevens, Toronto, 1990. Not shown is the Scientific Advisory Board which the Director-General appoints and oversees. This body will be the "executive organ" of the OPCW, responsible to the Conference.8 The method of choosing its 41 members represents a new experiment in international organization. There will be no permanent seats (and no vetoes). Instead, there will be a fixed number of seats for each region9 and within each region there will be a specified number of quasi-permanent seats, which are to be given, as a rule, to states with the most significant chemical industries in the region. A simple majority will be required to take decisions on procedural matters while a two-thirds majority will be required for matters of substance. A three-quarters majority will be required for one special purpose: preventing a Challenge Inspection from being carried out by the Technical Secretariat. The compliance provisions in the CWC are based on the assumption that, in the case of a possible violation at a suspected site, there will be at least one State Party that will request the OPCW to take steps to obtain information from the suspected party and that will request the Technical Secretariat to conduct a short-notice (challenge) inspection. The State Party making these requests is referred to in the CWC as the "requesting State Party". The State Party that is the subject of an inspection (whether challenge or routine/systematic) is, naturally, the "inspected State Party." In the mid-1980s, many of the members of the Conference on Disarmament, the forum in which the CWC was being negotiated, expressed the wish that the Convention include a procedure that would allow the requesting State Party, in particularly urgent situations, to call upon the Technical Secretariat to conduct a special type of inspection "anytime, anywhere". However, certain states, including the US which had originally proposed such inspections, backed away after considering the perceived national security risks for themselves. The final compromise achieved was short-notice inspections at any site using a technique of "managed access", where the inspectors may have to negotiate with the inspected State Party to observe certain areas within the site. Still, this level of intrusive inspection is unprecedented in a multilateral treaty. Any State Party is entitled at any time to request that a challenge inspection be carried out in any location in the territory of another State Party. Theoretically, Iraq could designate the Pentagon as the site for a challenge inspection-provided that Iraq and the US were both parties. There is, however, a mechanism to prevent the frivolous use or abuse of the challenge inspection procedure. Sometimes referred to as the World Court, this body sitting at The Hague hears cases where the Parties are either governments, the United Nations or some of its agencies. It is given two roles under the Convention: states parties may bring disputes to it and the Conference or the Executive Council may request advisory opinions.14 A disputing party is not able to compel another party to submit the matter to the ICJ for a binding decision (unless both parties have submitted themselves to the compulsory jurisdiction of the court).15 However, if the Conference or the Executive Council is involved in the dispute, it can submit the matter to the ICJ whether the other party likes it or not. In that event, the opinion issued by the ICJ would only be advisory but would still be considered authoritative. An international verification system is a sine qua non of effective treaty compliance. Without verification nations could cheat on the treaty, e.g., by keeping residual stockpiles of chemical weapons, with little fear of being caught. A good verification system builds confidence in the treaty which then strengthens the compliance regime. But verification should be done by a competent and respected international organization. The alternative is always much weaker: unilateral verification by adversaries, which quite likely leads to uncooperative behaviour and disputes. In addition, the OPCW was specially designed to meet the objections of the developing world to organizations dominated by major powers. There is no veto in any of the bodies of the OPCW. There are no permanent seats in the Executive Council. Inspections are to be carried out by international civil servants working for the Technical Secretariat. The Technical Secretariat will conduct initial inspections of most facilities promptly after they are declared. On-going routine/systematic inspections will be carried out afterwards at sites to be chosen by the Technical Secretariat, based on the information provided in the declarations and reports from the States Parties. Finally, challenge inspections may be carried out at short notice upon the request of any State Party. The manner in which the report of an inspection team is handled is potentially of great importance to the inspected State Party as well as to other States Party. Because the tone and substance of inspection reports will determine, to a large extent, how the OPCW responds at the earliest stage to potential or alleged violations, the manner in which such reports are handled is also of great importance to the compliance system. If the report contains confidential information about matters that have no connection with chemical weapons, the inspected State Party could quite justifiably take strong exception to the information being revealed to anyone. On the other hand, there could be certain countries, including the requesting State Party in challenge inspections, that would be anxious to see the report and to make their own judgement as to its relevance to the Convention. After inspection reports have been completed, the processes for dealing with them differ markedly for the cases of routine and challenge inspections. After receiving the report, the Director-General is responsible for determining whether it contains any "uncertainties"22 (presumably relating to compliance.) In this connection, he may be faced with 'differing observations" which individual inspectors are entitled to attach to the report.23 If he decides that the report contains uncertainties, he is directed to approach the inspected State Party "for clarification".24 This would appear to give him authority to undertake some active diplomacy with a view to persuading the inspected State Party to take action to rectify any problem; the Director-General is under no time limit in this connection. The confidentiality system is, at least in theory, quite strict. A strict confidentiality regime can be considered a compliance measure since nations and industry will be more forthcoming with information if they are confident that the information will not be divulged unnecessarily. On the other hand, obsessive confidentiality will cause the treaty to become unworkable since the flow of information is essential between parts of the OPCW. It remains to be seen whether a good balance has been struck. A request for a challenge inspection will usually be accompanied by information about the suspected site. Such information may come from "national technical means of verification" (such as satellite imagery) or from human intelligence (e.g., informers) or from other sources. In most cases, the information will be sensitive and the state providing the information may insist that the sources not be divulged. By placing the sensitive information in an Appendix, to be treated specially, it is thought that additional confidentiality can be achieved. It appears that the Appendix will not be released to anyone. Otherwise, the reports of challenge inspections seem to be much more accessible than those arising from routine inspections. If one State Party becomes concerned about the possibility of a violation by another State Party, it has the right to make a series of requests for additional information relating to compliance. There is no requirement that the requesting State Party must first await the report of a routine inspection. Indeed, the object of these requests may be a facility that is not subject to routine inspection. On the other hand, information provided in inspection reports may give rise to suspicions and trigger the requests for further information. 1. The first request is addressed directly to the other State Party. It calls for clarification and information sufficient to answer the doubts and concerns of the requesting State Party.34 The responding State Party is required to furnish this information "not later than 10 days" after the request. Although the text makes it appear that the purpose of these requests is to obtain clarification, the responding State Party would be expected to provide additional information and explanations—especially information that goes beyond what has been obtained through routine inspections and other routine sources, such as annual declarations. 3. If the requesting State Party still deems the clarification to be inadequate, it may request the Executive Council to obtain further clarification, in which case, the Executive Council is authorized, if it so decides, to set up a group of experts to examine the situation and submit a "factual" report.36 There is no provision for on-site inspections by the group of experts but they must "examine all available information and data",37 which may include the results of previous inspections and information supplied by the requesting State Party. At the conclusion of step 2 or step 3 (after clarification has been sought) or after a challenge inspection, if the requesting State Party still considers the explanations and clarifications are unsatisfactory, it may request a special meeting of the Executive Council. At this meeting, the Executive Council is authorized (if it so decides) to "recommend any measure it deems appropriate to resolve the situation".41 The Convention does not specifically state whether the purpose of these measures would be to obtain additional data or to persuade the respondent State Party to rectify or redress a presumed violation. In view of the fact that this provision appears in Article IX, which bears the heading "Consultations, Co-operation and Fact-finding," it would appear that these measures are to be restricted to providing assistance for additional fact-finding or data collection. After sixty days, if the requesting State Party still has doubts or concerns, it may request a special meeting of the Conference, in which case that body is authorized (if it so decides), to "recommend any measure it deems appropriate to resolve with the situation".42 As to the nature of these measures, the comments made above would apply here also, and accordingly, it appears that the measures authorized to be taken by the Conference would be for the purpose of eliciting additional information. Finally, where a State Party considers that its own compliance behaviour has been called into question, it has the right to request the Executive Council to clarify the situation for the purpose of exonerating itself.43 It would appear that this clause gives the Executive Council the right, in an appropriate case, to decide that a State Party is innocent of any transgression. After information has been obtained from inspections and other sources, it needs to be evaluated to determine whether it indicates compliance or non-compliance. However, the Convention is vague about the procedures to be followed in this connection. In fact, there are no provisions that explicitly authorize any particular body to decide between compliance and non-compliance. Nevertheless, it is submitted that the authority for making these decisions clearly exists by implication. The wording of various provisions in the Convention, as noted below, makes it clear that the Executive Council and the Conference, before deciding on various actions to secure compliance with the Convention, are each expected to decide first whether there is a situation calling for action (e.g., enforcement), and thus to decide as between compliance and non-compliance. The reason the authority to make these decisions was not stated explicitly may be related to an oddity in the negotiations. The US insisted during almost all phases of the negotiations that there should be a provision in the Convention that specifies that no "decision [should] be taken as to whether a Party is complying with the provisions of the Convention".44 It was only in the final days of the negotiations that the US withdrew its insistence on this point. By then, it seems there was no time or willingness to review the wording of the clauses that had been developed up to that point on the matter. These clauses were therefore left in a state of imprecision. Nevertheless, there are a number of provisions which strongly imply that decisions on compliance can be made by both the Executive Council and the Conference. The implication is that the Executive Council would not request measures to redress a situation unless it had decided that the situation constituted a violation or, at least, a potential violation. Again, the implication is that the Executive Council will decide whether or not any non-compliance has occurred before it decides on measures to redress the situation. It is likely that this provision will be invoked whenever the Executive Council is considering a possible violation, unless it is a blatant or deliberate violation. The State Party implicated will likely campaign for a resolution absolving it from all wrong-doing and, of course, it will cite this provision. If it does so, the Executive Council, in order to "clarify [the] situation," would usually have to make a decision as between compliance and non-compliance. In addition to the provisions that by implication can be regarded as conferring the right to make compliance decisions, possibly a more compelling factor is that if the required majority of the members of the Executive Council or the Conference are desirous of making such a decision, as a practical matter, it is highly likely that they will do so. In order to deter them, a clear prohibition in the Convention would be necessary. Not only is such a prohibition absent, instead, the above-quoted provisions suggest the very reverse: such decisions are actually expected. The indirect wording of the provisions should not detract from the reality of the authority of the Executive Council and the Conference. The last-minute withdrawal by the US of its insistence on a prohibition against such decision-making power fully explains why there was no time in the negotiations to develop more precise wording. If time had permitted, not only could greater precision and clarity have been achieved, but also the Convention might have included provision for certain procedures to be followed before making such decisions in order to ensure fair treatment for the suspected State Party. Also, the Convention might have dealt with the possibility of a difference of opinion occurring between the Executive Council and the Conference as to whether a given situation constituted a violation. These omissions are not serious, however, they can be rectified by the Executive Council and the Conference when these bodies come to lay down their rules of procedure. The Executive Council may issue a formal request to the respondent State Party "to take measures to redress the situation within a specified time".51 For example, a request to dismantle a weapons production facility would appear to be included within this provision. Afterwards, the measures to redress are those taken but by the Conference. The reference to "cases where a State Party has been requested" early in the paragraph obviously indicates a request by the Executive Council referred to section III.C. It should be noted that the Conference is given not only the power to restrict or suspend the rights or privileges under the Convention, but additional unspecified powers by virtue of the words inter alia. It would appear that these words would be sufficient to authorize the Conference to take any measures whatsoever, provided the respondent State Party had failed to comply with a request issued by the Executive Council. The Conference may not, however, take away the membership of a State Party in the organization. This right is guaranteed in Article VIII, para. 2: "A State Party shall not be deprived of its membership in the Organization." But the right to vote is a benefit that could be withdrawn. The right to "participate in the fullest possible exchange of chemicals, equipment and scientific and technical information" (Article XI) is another. It is quite possible that as a sanction for non-compliance, the Conference would recommend a suspension of trade in some or all chemicals, starting perhaps with Schedule 1 and 2 chemicals and progressively increasing the list to include Schedule 3 and other chemicals. Although the term "sanctions" does not appear in this provision, the term collective measures in this context would include sanctions, especially since the word "sanctions" appears in the title of the article. It is to be noted that the Conference is authorized only to recommend, but not to require, its members to impose sanctions. An attempt was made during the CWC negotiations to draw up a list of sanctions but no such list was included in the Convention because it was deemed by some states that the Conference needed maximum flexibility in its response. The reference to "conclusions" in this paragraph is at odds with the interpretation that the Conference cannot decide on acts of non-compliance. One explanation is that the referral applies when there is sufficient data on hand to indicate at least the possibility of a violation. There is, however, no requirement that a requesting State Party complete the steps outlined above for obtaining additional information. Nor is there any requirement that the requesting State Party or the Conference await the report of any inspection team. States Parties are given the right to participate in "the fullest possible exchange of chemicals, equipment and scientific and technological information" relating to chemistry.63 They also pledge "not to maintain among themselves any restrictions..., which would restrict or impede trade and development" in the chemical field.64 This is both an incentive to join the Convention and a disincentive to withdrawing from the Convention. Although the provision is not detailed, it can be regarded as an important part of the compliance system. The Convention contains a general provision requiring all States Parties not to "assist... anyone to engage in activities prohibited to Parties under this Convention".65 The US proposed during the negotiations that this Article be elaborated to provide that Parties must "refuse to trade in CW-related materials with all States that do not become Parties to the CW Convention within a reasonable period of time." In presenting this proposal, the US delegate argued that the Convention needed "restrictions and disincentives for countries who, after a reasonable period of time, choose to remain outside [the Convention]".66 The Convention does provide that States Parties are entitled to maintain restrictions on non-parties. The Article also provides a means for a state to avoid having to consider retaliation with chemical weapons.68 Otherwise, if a State Party is threatened with chemical weapons, it may be tempted to withdraw from the Convention and to start arming itself so as to be able to retaliate in kind. One of the purposes of this Article is no doubt to persuade such parties to continue to abide by the terms of the Convention. In this sense, the Article can be regarded as one of the elements of the compliance system. The Convention contains a prerequisite that must be fulfilled before the right of withdrawal is exercised. The party wishing to withdraw is required to give 90 days notice and specify the "extraordinary events, related to the subject-matter of the Convention, [which] have jeopardized [its] supreme interests".69 This type of clause, with variations as to the length of notice, is to be found in most of the disarmament treaties signed since World War II. It would not be inappropriate for the OPCW to comment on such a statement but the Organization would have to accept that the State Party can interpret its supreme national interest in its own way. The Convention states that for disputes relating to interpretation of the Convention, "the parties shall consult together with a view to the expeditious settlement of the dispute by negotiation or by other peaceful means of the parties' choice, including recourse to appropriate organs of this Convention." "By mutual consent", they may refer the matter "to the International Court of Justice in conformity with the Statute of the Court".71 This leaves broad discretion to the parties to the dispute; they need only "keep the Executive Council informed of actions being taken".72 This provision has little legal effect since the consent of both parties is always necessary for a referral to the International Court of Justice, and disputing states parties and non-parties to the ICJ statute are always entitled to make a referral to the ICJ. Advisory opinions could be quite significant. Although not binding, such an opinion would have considerable persuasive effect; in a borderline case, the rendering of such an opinion against a respondent State Party would make it difficult for it to argue that its activities were not prohibited by the Convention. This provision would normally only be invoked when the matter was not one of urgency, since advisory opinions can take many months to be rendered. As in the case of the IAEA, the General Assembly is entitled to confer blanket authorization upon certain organizations so that it would not be necessary to obtain specific authorization for each specific request for an opinion. This matter will, no doubt, be delineated in the relationship agreement between the OPCW and the United Nations that has yet to be developed. Generally, the measures outlined above are to be taken by the international community of nations through the OPCW. The Convention also provides a number of compliance measures which are to be taken within nations. Such domestic compliance measures are outlined below. One of the most important and innovative compliance provisions in the CWC is the provision for penal legislation. The most significant part of this paragraph is sub-paragraph (c), which appeared in the Rolling Text for the first time in January 1991.75 It is the first time that penal legislation is specifically required under a disarmament treaty. Through this provision, the international treaty is backed by national law enforcement procedures. Each State Party is required to designate a National Authority to act as "the national focal point for effective liaison with the OPCW and other States Parties".76 Presumably, the National Authority will be given responsibility, inter alia, for informing facility operators in the private sector of their obligations under the Convention, e.g., of keeping records, supplying information and opening their plants to OPCW inspectors. No doubt the National Authority would need supporting legislation to ensure cooperation by the facility operators for matters such as granting access and the keeping of records. The existence of a body within the government which is available to address potential problems with the implementation of the Convention can be of great advantage to the OPCW. On the other hand, the National Authority could also be used to help orchestrate non-compliance. But given the great degree of information exchange required by the treaty, the presence of a national authority to provide active liaison with the OPCW must be seen as an asset and an important compliance provision. When assessing the efficacy of the Compliance System under the CWC, it should be borne in mind that the Convention is aimed at putting a stop to a process—namely preparing to use chemical weapons. The Compliance System must allow for all information to be objectively evaluated to expose a violation at a sufficiently early stage and for action to be taken against the violator to persuade it to cease and desist in its preparations and, finally, to nullify any preparations already made. Against this criterion, a few of the strengths and weaknesses of the Compliance System are examined in the following paragraphs. Then some proposals for strengthening the system are offered in section IV.C. Another strong point is that evaluation by an international organization is possible. However, as noted above under the section "Evaluation of Compliance" (Section III.D), the provisions allowing the Executive Council and the Conference to make decisions as between compliance and non-compliance are unfortunately not explicit. But by implication, the Convention allows an authoritative decision to be made as to whether a given activity constitutes a breach of the Convention. An evaluation decision is not so important for breaches that are perfectly obvious, for instance, the discovery of a cache of battle-ready weapons. In those cases, there would be no real argument about the fact of violation. But in borderline cases, where something like a stockpile of dual-use precursor chemicals is involved, it will be very important to have an authoritative ruling on the question whether the quantity in the stockpile can be justified on the basis of industrial or other peaceful use.78 Had the Convention specifically prohibited such rulings, as the US was proposing, there would have been possibilities for serious arguments in these borderline cases about the existence of a violation, which would in turn have made it difficult or impossible to muster support among the States Parties for taking action against the State Party in question. A further strong point in the system relates to the Director-General's consultations with a State Party to "resolve or clarify ... uncertainties about compliance". (As discussed in Section III.C), there is a special opportunity in this connection that needs to be emphasized. The implication is that where the State Party does not clarify a situation to the satisfaction of the Director-General (by supplying additional information), the Director-General should consult with the State Party in an attempt to persuade it to "resolve" the problem, presumably by taking the necessary steps to correct it. Only if this effort is unsuccessful is the Director-General required to report the problem to the Executive Council. 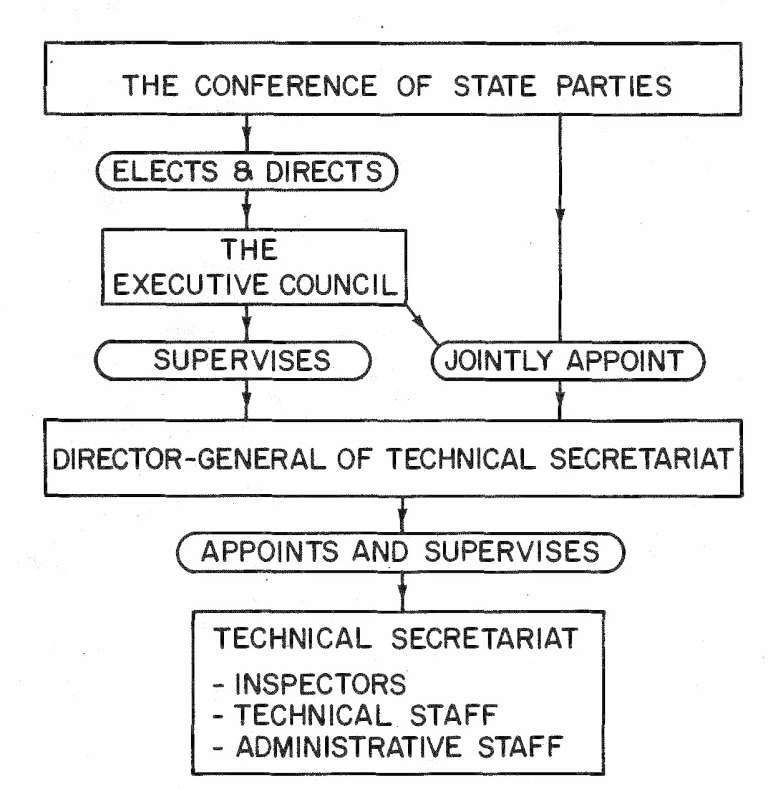 The special opportunity arises from the fact that the Director-General is able to assure the State Party that any information received by the Technical Secretariat relating to the matter will not be given to the Executive Council and will not go beyond the Technical Secretariat provided the inspected State Party takes the necessary steps to resolve the matter to the satisfaction of the Director-General. This puts the Director-General in a position to exert gentle pressure upon the inspected State Party. Another strong point relates to the manner in which the Conference is entitled to deal with non-Parties. For instance, if a Party were to withdraw from the Convention and proceed to acquire chemical weapons as a non-Party, the Conference would be entitled to recommend that all States Parties impose sanctions and other collective measures. It is important to note that the provision dealing with collective measures is not limited to non-compliant States Parties but extends to former States Parties.79 This would constitute a significant disincentive to withdraw. The fact that this right of sanction is spelled out in the Convention may be more important than might be immediately obvious. It would seem that, once a Party has withdrawn from a treaty, the Security Council is reluctant to impose sanctions. According to one knowledgeable source,80 the members of the Security Council were prepared to vote for sanctions against North Korea in 1994 for breaches of the NPT, but changed their minds after North Korea gave its notice of withdrawal. No sanctions were ever imposed. They apparently believed that there would shortly be no outstanding breach of the treaty. Had the NPT contained a provision similar to the one referred to, the outcome could have been different. Another strong and important point is to be seen in the fact that sanctions can be imposed without the cooperation of the Security Council. Mandatory sanctions, of course are preferable but the possibility of recommendatory sanctions under Art. XII means that if a group of States-say a small group of major trading nations-is prepared to impose sanctions, its actions can be legitimized even if the Security Council refuses to act, provided of course that the endorsement of the Conference can be obtained. Of the various weaknesses in the Compliance System, some can be remedied by the Preparatory Commission (which is currently preparing for the entry into force of the Convention) or by the Conference, while others would require an amendment to the Convention. The provisions dealing with confidentiality, although a significant advance on any other treaty, are still altogether too vague. Fortunately, the Preparatory Commission is able to rectify this problem and is now engaged in the drafting of a classification system for confidential information. However, although three categories have been identified, as of this writing the Preparatory Commission has not yet created a category reserved for information that is to remain within the Technical Secretariat and not disclosed to the Executive Council unless found to be relevant to a compliance problem.81 The creation of this category, together with the adoption of rules relating to disclosure of information in this category, is important for the establishment of an effective confidentiality system. The published reports give no hint as to the reason for ignoring this matter to date. Although the provision requiring States Parties to enact penal legislation should be regarded as a significant strong point, there is an unfortunate weakness involved in the wording of the provision. The problem is that the provision does not make it clear that the legislation should be binding on government officials and military personnel. It is particularly important that there be wording to this effect in the case of common law countries. The prevailing rule in these countries, including Canada, is that no legislation is binding on the government unless it contains a special clause to the effect that the particular law "shall be binding on the Crown".82 This special clause is inserted only rarely and reluctantly by such States. Finally, a significant weakness in the Compliance System arises from the fact that its growth and development will be severely hindered by the nature of the Convention's amendment provisions. For any substantial amendment, the effect of these convoluted provisions is to give all States Parties a veto. The task of amending multilateral treaties is already very difficult, even when the amendment provision allows considerable flexibility. With the current provision, substantive amendments will be almost unthinkable. Fortunately, the picture is not all black. There remain limited opportunities for growth and change in the Compliance System within the confines of the Convention as presently worded. The Convention fortunately provides a simplified amendment procedure for changes in the schedules of chemicals, thus allowing for new developments in technology.83 In addition, there are certain steps that could be taken by the Preparatory Commission and the Conference that would have the effect of improving the Compliance System—steps that would be within the ambit of their authority under the Convention. Some of these opportunities are explored in the next section. It should be noted at the outset that the proposals outlined below for measures to deal with violations fall within the category of non-military measures. It is argued that military action by the Security Council or otherwise is not a viable method of dealing with violations under disarmament treaties. Instead, various coercive and persuasive measures are proposed. Recent events in the former Yugoslavia, Somalia and Rwanda all point to the fact that military measures to enforce any type of international norm are unlikely to materialize unless the world in general becomes exceedingly alarmed and aroused. Unfortunately, the required degree of excitement is not likely to occur in the case of a breach of a chemical disarmament treaty. This is partly because the stage at which breaches of such a disarmament treaty need to be dealt with is the stage where preparations are in progress, not where weapons are already destroying cities and killing people. If the problem is only weapons under preparation, enthusiasm for launching a military operation would be difficult to arouse. Experience has shown this to be true even when the weapons under preparation were nuclear. In the case of the North Korean violation of the NPT, the possibility of a military engagement to deal with the matter reached the stage of public discussion but never was considered seriously in the Security Council. All of which highlights the importance of developing non-military measures to deal with breaches of disarmament treaties. The plain fact is that, for disarmament treaties, the military response is a rubber crutch-worse than useless, because its false promise leads us to ignore the importance of developing other means of dealing with the problem. The search for non-violent measures that are truly effective is difficult enough in itself. The problem is compounded by the fact that in the case of chemical weapons, the Convention has already been signed. Nevertheless, although the time for making changes in the Convention is past, there are still opportunities for putting in place certain limited improvements in the compliance system. – collective measures under Article XII.3. It is against this background that it may be relevant to look at possibilities for making improvements in the Compliance System at this late date. What follows is an outline of proposals that could be considered either by the Preparatory Commission or by the Conference. The first is a proposal for the development of an official list of consequences. The objective would be to ensure that a State Party contemplating a violation of the Convention would be aware of the consequences of such a course of action-and in greater detail than what appears in the Convention. – the right to vote at an Amendment Conference and other rights relating to amending the Convention. Suspended under this proposal would be the right given under Article XV, which in effect allows a State Party to veto any proposed amendment. One other item demanding special attention is the suspension of the right of withdrawal from the Convention. If a State Party is discovered to have been systematically and covertly violating the Convention by accumulating stockpiles of chemical weapons or making other preparations relating to chemical weapons, it is argued that the Conference would be entitled to suspend its right to withdraw. The suspension should continue until the State Party has destroyed its stockpiles and otherwise nullified its preparations. It is to be noted that the right to withdraw from a treaty is not an inherent right under international law and, except in unusual circumstances, only exists if conferred by the treaty itself.93 It is argued that, since the right in this case is specifically conferred by the Convention,94 it can be validly suspended by the Conference under Article XII. No State Party should be allowed to exercise a right contained in a treaty that it has been secretly violating until it has ceased its violations. – in serious cases, an additional resolution could be adopted warning all States Parties that the delinquent Party should be regarded as an untrustworthy treaty partner. – a request that the Security Council consider adopting the same or similar collective measures. By addressing conclusions of this type to the Security Council, the Conference would make it difficult for members of the Security Council to vote against taking action against the delinquent State Party. The next proposal consists of a series of isolation measures that could be imposed on the delinquent State Party. Under its authority to recommend collective measures,97 the Conference could recommend that all States Parties impose a regime of isolation upon the delinquent State Party. This regime could extend beyond economic measures and could include a series of measures that would have the effect of making life unpleasant in the target community. For instance, a rarely mentioned part of the UN Charter authorizes the Security Council to impose a communication blackout. Article 41, which is part of Chapter VII, speaks of interruptions to postal, telegraphic and other means of communication. This would strike at both official and personal communications. Even mail and telephone contacts with relatives abroad would be blocked. Travel would be tightly controlled and would require special permits issued by an international authority. While recommending these measures to States Parties, the Conference could request the UN Security Council to adopt the plan, which would make the provisions mandatory. But even if this proved impossible, some of the major industrialized nations might be prepared to participate voluntarily, enough to give real effect to the regime. Another isolation measure would be financial sanctions, a relatively inexpensive form of economic sanctions. This would involve not only the freezing of assets, but also the denial of banking services. The objective would be to make it difficult to conduct trade, since the restrictions would interfere with arrangements for payment of the price of imports and exports. One advantage of this method is that individuals, including leaders, could be targeted. The next proposal builds on a type of activity that the UN already undertakes on occasion in various parts of the world. A campaign of persuasion could be conducted under the supervision of the Director-General with a view to bringing about a change in the government's policy towards complying with the Convention. This campaign would be primarily directed to the elements within the community upon whom the government depended for its support. Such a campaign would be particularly important as a concomitant to the isolation measures proposed above. The citizenry should be made to understand the reasons for the harsh treatment meted out under the isolation regime. Finally, the Conference could recommend that States Parties impose an airport tax. This would be a tax levied on citizens of the delinquent State Party when travelling through the territory of other States Parties. The amounts collected would be turned over to the OPCW and the tax-paying travellers would be given a receipt explaining that the tax was levied because their country was in violation of the treaty. The receipt would also state that the tax could be reclaimed from the OPCW when the country had remedied its violation. The objective would be to ensure that a large number of citizens became aware of the violation and were motivated to bring pressure to bear upon the government to comply with the Convention. Very few of the measures outlined in this paper for dealing with the problem of non-compliance can be undertaken without significant supporting activity on the part of member States. Possibly, the only exception is to be seen in the consultations that the Director-General is entitled to undertake with a suspected delinquent with a view to persuading it to rectify non-compliant behaviour (referred to Section IV.A above). Most of the other efforts to persuade or coerce delinquents are totally dependent on active participation from member States. To the extent that this is true, it becomes clear that, when coercive measures become necessary, the most the Convention can offer is an institutional framework through which such measures can be taken by member States. This is not to belittle the importance of the framework. It offers three essential elements: legitimacy; machinery; and encouragement. For each of these items, some explanation is in order. The legitimacy offered by the Convention has less to do with legality than with acceptability. The Convention attempts to make the coercive measures more acceptable to the international community. The Convention seeks to achieve this in three ways. It provides the means by which an authoritative decision can be made as to the existence of the violation in respect of which the coercive measures are to be taken. Secondly, it provides the means by which the approval of the international community can be registered for any particular coercive action. Thirdly, it provides a more acceptable vehicle for taking coercive measures—one that will be perceived as being directed and controlled by a body representing the international community (in this case, either the OPCW or the UN), rather than one controlled unilaterally. Just as important as the legitimacy is the machinery that the Convention offers to member States contemplating coercive action. Primarily, it consists of a readily available forum in which decisions can be made for initiating and directing the action. Also offered are possibilities for putting in place stand-by arrangements for conducting operations on a collective basis. The necessity for arrangements of this type is easy enough to appreciate in the case of a military operation; but it is also important to have such arrangements for the purpose of coordinating a sanctions effort. Finally, the encouragement provided by the Convention for taking action of this type is to be seen in several aspects of the Convention: the prohibitions, the inspectors' reports, the opportunities for an individual State Party to insist on debate of a case of suspected violation, the possibilities for condemnatory resolutions and the fact that the machinery for joint action stands ready for use. Were it not for these provisions, if a country was discovered making active preparations for chemical warfare, there would be less incentive to take action to deal with the problem as a global undertaking, with the result that the matter would likely be left to be handled unilaterally by the country's adversaries, who may or may not be willing or able to act. With a Convention in place containing these provisions, the problem is less likely to be ignored, since the rest of the world would be encouraged to get involved. This then is what the Convention offers to its member States by way of support for their efforts in the area of persuasion or coercion: legitimacy, machinery and encouragement. It is on the basis of these factors that the efficacy of the Convention's compliance system should be judged. One wonders whether it would have been possible for the Convention to go one step further and provide for coercive measures of a type that could be undertaken without the participation of member States. As with the Director General's consultations, measures of this type are likely to have a fairly low level of impact on the delinquent State. Nevertheless, low-impact measures have a place in the compliance system; further study of opportunities in this area is warranted. Fortunately, the Convention's compliance system does not rely entirely on coercive measures aimed at correcting a situation after a compliance problem has arisen. Other features of the system are aimed at preventing problems from arising. Many of these features rely on deterrence, the most important being the information system, involving inspections and other methods of acquiring information as to whether or not a State Party is complying. The inspections are intended to verify the information given in the declarations, and the system relies on the assumption that no country would want to be caught falsifying its declarations. Not to be forgotten, too, are the Convention's supplementary devices for promoting compliance. They also are aimed at preventing problems from arising. Of these, the provision for mandatory penal legislation is a device whose development will be followed with particular interest. Only if these deterrents and other features fail to prevent a violation from occurring will it be necessary to resort to measures involving persuasion and coercion. Following the poison gas attack in the Tokyo subway in March of 1995, the question has been raised as to whether the CWC would have altered the course of events had it been in operation at the time. The Convention of course is not targeted upon the behaviour of individuals or groups-terrorist or otherwise-but upon the behaviour of nation States-specifically those that choose to become Parties. In this respect, the Convention is no different from any other treaty. Nevertheless, this particular Convention contains several features that will have the effect of making it more difficult for terrorist groups to obtain the ingredients for chemical weapons, even though these groups are not specifically targeted in the Convention. This preventive effect, although incidental, occurs as a result of the Convention's information system and the legislation required to be enacted by States Parties. An important side-effect of the information system is that every State Party, in order to comply with the requirements for filing declarations, will have to do a complete survey of its chemical industry and thus to collect information relating to all chemicals that are known to be ingredients or precursors of the chemicals used for chemical weapons. Since the declarations are required to be filed annually,98 the information collected by the state authorities will have to be updated annually. If there are quantities of the ingredients missing whose absence cannot be explained, it is likely that the state authorities will investigate. If as a result of their investigations, the authorities are led to a suspicious group or a suspicious location, the legislation requirements under Article VII will become important. The authorities in that event will need legislative authority to inspect and if necessary to conduct a sudden raid and to seize any illegally held chemicals. In order to be effective, however, the legislation must be drafted in such a way that regulations can be made that will stipulate the maximum quantity of each chemical that may be produced, used or possessed by each chemical facility in the country. Regulations will also be necessary to cover imports and exports. No doubt, most countries will chose to effectuate these controls through a licensing system. But it is important to understand that the Convention specifically requires regulations of this type only in the case of Schedule One chemicals.99 For chemicals listed on Schedule Two and Schedule Three, there are no quantity limits specified in the Convention; it is therefore sometimes argued that States Parties are not required to enact legislation to control these chemicals, except in respect of exports and imports. Accordingly, it can be expected that there will be some countries that choose to enact a narrow form of legislation-one that does not place limits on the quantity of Schedule Two and Schedule Three chemicals that can be produced or possessed.100 Under this narrow type of legislation, if it should occur that the reports filed with the authorities in connection with the declarations indicate some missing chemicals of the type listed in Schedule Two, and if there was reason to suspect that the missing chemicals were located in a particular place, the authorities would not be permitted to inspect, nor to conduct a raid, nor to seize any chemicals. On the other hand, it can be expected that there will be other countries that choose to enact a broader form of legislation—one that will identify prohibited activities for at least some of the chemicals listed in Schedule Two and Schedule Three.101 For these countries, if the authorities were to discover a secret cache of these controlled chemicals, they will have authority to inspect, or if necessary to seize the chemicals before they can be used in a terrorist attack. Thus, although the Convention does not attempt to deal with the problem of terrorism directly, it will have an indirect effect tending to prevent terrorism, but the efficacy of its preventive effect will be rather slight for countries that choose to enact a narrow form of legislation under the Convention. The importance of effective legislation is illustrated by the case of the Tokyo gas attack in March 1995. The particular type of gas used by the terrorists in the subway was sarin. As of this writing, many members of a fanatical religious group, Aum Shinrikyo, have been arrested and charged with being involved in the attack. It now appears that the group had been stockpiling the ingredients for making sarin for many months prior to the incident. Some reports have suggested that the police knew about these stockpiles well before the attack in March, but felt unable to do anything about it. According to these reports, one possible reason that the police took no action may have been that they lacked the authority under any legislation existing at the time. Soon after the attack, the Japanese Diet quickly enacted the necessary legislation and shortly thereafter, the police raided the headquarters of the cult near Mount Fuji; while arresting the cult leader, they seized hundreds of tonnes of chemicals that could be used for making various types of chemical weapons. These stories certainly make it appear that, had the Chemical Weapons Convention been in place and had Japan enacted the necessary legislation, the police might have seized enough of the key chemicals to forestall the attack that occurred on 20 March 1995. In one sense, the Tokyo gas attack may turn out to have the effect of strengthening the Chemical Weapons Convention. As the various countries consider the contents of the legislation they propose to enact, the Tokyo incident could emphasize the importance of drafting the legislation so that it includes authority to regulate Schedules Two and Three chemicals. The Convention goes a long way towards building an effective compliance system. The fact that the system has shortcomings means that there must be continuing efforts made to devise improvements, as well as efforts to find ways of circumventing the Convention's rigid amendment procedure. Efforts to devise improvements might be expected from the academic community. It is a remarkable fact, however, that the compliance system that was developed for the CWC is almost entirely the product of governments, with little input during the negotiations from non-governmental academics. The reason this occurred was not that the negotiations were conducted entirely behind closed doors; regular reports on progress and proposals were published at least every six months during the latter years of the negotiations. The responsibility for the absence of non-governmental input lies with the members of the academic community themselves, and to some extent with their funding sources. Indeed, it is time to recognize that a new field of study is beginning to materialize, namely that of treaty compliance methodology. With treaties playing a governance role in ever-increasing areas of human activity, academics, treaty negotiators, officials tasked with implementing treaties and even those whose duties involve complying with treaties, would be wise to develop knowledge and expertise on the subject of securing compliance with treaties. 1. 172 pages is the length of the English text in the certified true copy of the Convention. The certified true copy includes texts in the six official languages of the UN (Arabic, Chinese, English, French, Russian and Spanish) and all these texts are 'equally authentic" (Article XXIV). 2. "This Convention shall enter into force 180 days after the date of the deposit of the 65th instrument of ratification, but in no case earlier than two years after its opening for signature" (XXI.1). 3. References in this paper to paragraphs of the CWC follow the system introduced in the document "Index to the Chemical Weapons Convention" by A. Walter Dorn, UNIDIR Research Paper 18, United Nations, New York, 1993 (UN Sales No. GV.E.93.0.13). Paragraphs which are to be found in the articles of the Convention begin with the roman numeral of the article (l-XXIV) while those in the three annexes begin with one of the following abbreviations: AC (Annex on Chemicals), VA (Verification Annex) and CA (Confidentiality Annex). For example, the above reference is to Article XXI, paragraph 1. As a further example, VA.X.1 refers to the Verification Annex, part X, paragraph 1. 9. VIII.23. The five regions and the number of seats in each are: Africa (9); Asia (9); Eastern Europe (5); Latin America and the Caribbean (7); Western European and other the States (10). In addition, there is a rotating seat for Asia and Latin America and the Caribbean (10). 12. The pronoun "he" is used in this paper for convenience and does not imply that the Director-General is a male. 15. States Parties to the ICJ Statute "may at any time declare that they recognize as compulsory ipso facto and without special agreement, in relation to any other state accepting the same obligation, the jurisdiction of the Court in all legal disputes ..." concerning international law. Statute of the International Court of Justice, Article 36, para. 2. 16. A. Walter Dorn and Ann Rolya, "The Organization for the Prohibition of Chemical Weapons and the IAEA: A Comparative Overview", IAEA Bulletin, 3/1993, pp.44-47. 18. See IX.21 and VA.II.62. 25. VA.II.65; see also VIII.40. 42. IX.7. The request for such a meeting would need the support of either the Council or one-third of the members of the Conference (VIII.12). 44. This position was stated in the various preliminary negotiating texts of the Convention (the "Rolling Text") in the form of footnotes. See for example CD/1116 (20 January 1992), Article VIII.20(d), footnote No. 2 (p. 35 in the English version). 57. See UN Charter, Articles 24 and 53. For a brief discussion of this matter, see Charter of the United Nations: Commentary and Documents, Third Edition, by Leland M. Goodrich, Edvard Hambro and Anne Patricia Simons, Columbia University Press, 1969, p. 364. See also Gwyn Prins: "The UN and Peace-Keeping in the Post Cold War World", Bulletin of Peace Proposals, vol. 22, No. 2, June 1991 and Oscar Schachter: "United Nations Law in the Gulf Conflict", American Journal of International Law, vol. 85, p. 452. 58. VIII.21(k), VIII.35 and XII.1. 59. These powers arise by virtue of the phrase inter alia appearing in VIII.36. 66. CD/PV.602, p. 8, 15 August 1991. 68. Many of the signatories to the 1925 Geneva Protocol reserved the right to retaliate in kind if chemical weapons were used against them. The Chemical Weapons Convention permits no such reservation. 73. See for instance, article 10 of the Relationship Agreement between the IAEA and the UN, General Assembly resolution 1145 (XII) of 14 November 1957. 78. The controlling provision here is II.1. 80. William Epstein in private conversation, March 4, 1995. 81. See the Second Report of the Expert Group on Confidentiality: PC.VI/B/WP.15, 18 March 1994. The latest report of the Preparatory Commission is silent on the matter: PC.LX/11, 9 December 1994. 82. Canada's "Chemical Weapons Convention Implementation Act" (Statutes of Canada, 1995, chapter 25) contains such a clause: sec. 5. 84. The mandate is contained in a document, adopted at the CWC signing ceremony in Paris in January 1993, called "Text on the Establishment of a Preparatory Commission" (UN Doc. A/47/27, Appendix 1). 89. VA.II.1-9; VA.X.1 & 2. 93. Articles LIV & LVI of the 1969 Vienna Convention on the Law of Treaties. 95. The "Peoples Korea" published in Tokyo. 98. VA.VID, VA.VII.A, VA.VIII.A and VA.IX.A. 101. See for instance Canada's "Chemical Weapons Convention Implementation Act" Bill C-97, 1995). 102. See Australia's "Chemical Weapons (Prohibition) Act," No. 26 of 1994, sections 16(2)(3), 22(e), 77(2)(3). Prohibited activities are not referred to in the Act, but could, by regulation, be prescribed as part of the conditions attaching to the permits required for plants producing schedule 2 or 3 chemicals. The Markland Group has materials on this topic aimed at assisting graduate students working in this area. (c) The aggregate amount of such chemicals at any given time for such purposes is equal to or less than 1 tonne". 2. A certificate stating: that the transferred chemicals will only be used for purposes not prohibited under the CWC; that they will not be re-transferred; the types and quantities of the chemicals; the end use(s); and the name(s) and address(es) of the end-user(s).